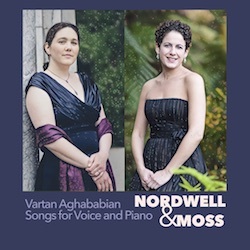 Whimsical and profound, with texts by A.A. Milne and Emily Dickinson; living-composer Vartan Aghababian’s song cycles for voice and piano performed by Ann Moss, soprano and Hillary Nordwell, piano. This two-disc set includes recordings of David Conte's most recent vocal composition offerings from collections: American Death Ballads, Three Poems of Christina Rossetti, Love Songs, Everyone Sang, Lincoln, Sexton Songs, and Requiem Songs. The album includes program notes by the composer. Premiere recordings of bold new works of vocal chamber music by American composers Jake Heggie and Liam Wade. Innovative arrangements of classic love songs by Bob Dylan, Joni Mitchell and The Beatles. Standout performances from pianists Steven Bailey, Jake Heggie, and cellist Emil Miland. Featuring cameos by violinist Isaac Allen and Chanticleer. Music by Weslie Brown, Liam Wade, John Thow, Vartan Aghababian, and Joni Mitchell. Featuring the Hausmann Quartet; Steven Bailey - Piano; Karen Rosenak - Piano; Jeremías García - Guitar; Matt Berkeley - Acoustic Piano, Hammond B3, Fender Rhodes; Dewayne Pate - Bass; Joe Bagale - Drums. Produced by Leslie Ann Jones at Skywalker Sound. Composed, performed and recorded by Ann Moss. Inspired by Between Appear and Disappear, a new hybrid of photographs and poetic texts on beauty and love by author/photographer Doug Rice. Field recordings of the American River in Lotus, CA by Dave Firenze. Field recordings of Beaver Pond Dam in Lincoln, MA by Ann Moss. Composer Kenneth D. Froelich's debut album – a collection of quirky, evocative, engaging, and – most importantly – nerdy chamber works. Featuring Steven Bailey - Piano. Song cycles by composer Don Walker (b. 1941) with poetry by Emily Dickinson focused on nature, love, religion, and death. Featuring Karen Rosenak - Piano. Sebastián Durón's Salir el amor del mundo (Love Leaves the World) – an early Zarzuela dating from 1696. Featuring El Mundo Ensemble, Richard Savino - Guitar, Director. Recorded at Skywalker Sound.